When you’re drowning, the last thing you do before you go unconscious is take a breath. The carbon dioxide rises so much in your blood it overpowers the last few molecules of oxygen in your body. You reach your breaking point, then you inhale. I inhaled food my whole life and I reached my breaking point in my battle with weight loss. What if there were things I believed that weren’t true? What if calories in and calories out had exceptions? What if we don’t all metabolize food the same? Why can’t we successfully lose weight and keep it off? I had to find out – my life depended on it. In my quest to break my weight loss code, the Buffer Zone is the space where I found my truth. I enjoyed this book and think the author knows his stuff. This is an overview of what the author learned doing his own search to be healthier. I agree with a lot of what he say. There is no one plan for all of us to follow, instead he gives information on food, nutrition, and exercise. 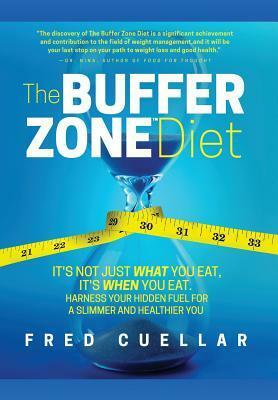 What Cuellar means by “Buffer Zone” is the “space between the meals”. He says it takes ten hours of no eating before your body primarily switches to body fat to run your body. Some of his wording was a bit hard to follow, and I had to go back over it a few times to “get it”. Taking notes would have helped I think. I don’t know if I’ll follow this way of eating, but I’m still glad I read the book. Sounds like he has some interesting ideas. He makes a lot of sense, and has a lot of ideas. Just don’t know if that way of eating would work for us. This sounds interesting. I’d like to lose a little weight but am struggling with motivation and I’d be interested in hearing what he has to say. If I didn’t eat my meals at such weird hours due to work, I’d like to try his “plan”, but I don’t think right now it would be so easy. Maybe if my schedule gets more normal I’ll try it. I think there is something to idea that everyone’s unique. I don’t think there’s a simple formula. I agree! When it comes to losing weight or getting healthier, there is no one plan for everyone. This really does sound interesting. I think one of the key ideas is to give your body a longer break between meals. Have a great weekend, Vicki! Thanks Susan, I hope you have a great weekend too!